Stoke Newington Literary Festival's 'pink plaque' campaign earlier this month was the latest in a history of imitators of London’s iconic blue dinner-plate-sized memorials. But who else has tampered with the historic scheme? Blue plaques are so old, they nearly deserve a memorial of their own. London’s scheme was founded in 1866, according to English Heritage. The oldest plaque you can still see is one for Napoleon III, put up in Westminster in 1867. 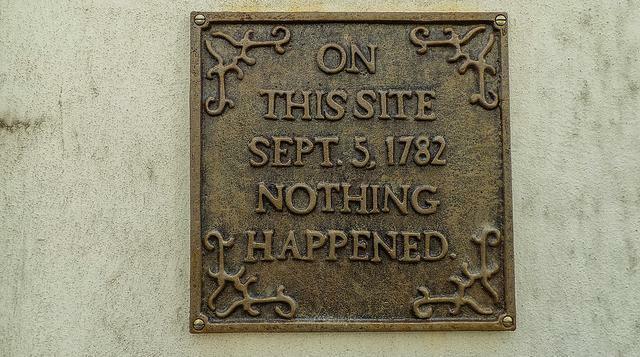 The Corporation of London was the first to start an alternative plaque scheme — to this day out of all the plaques in the Square Mile, you can only see one true blue one (for Dr Johnson). London boroughs soon started up their own scheme, with Westminster erecting green plaques. Southwark has a new blue scheme, and Islington another green plaque one. But it was only a matter of time before blue plaques caught the imagination of other Londoners. 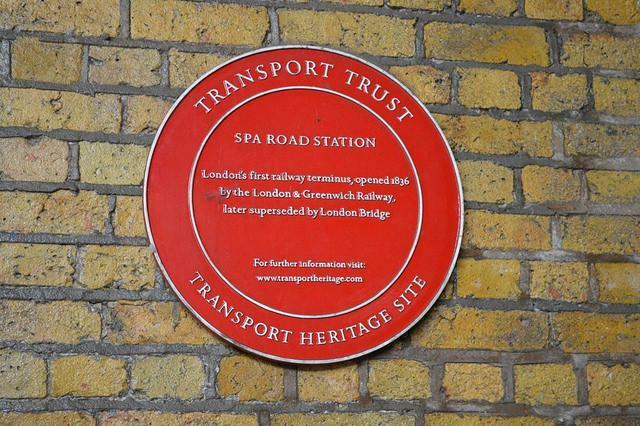 The Transport Trust was the first to use red plaques, as part of its Red Wheels scheme, which you can see at Victoria coach station, Spa Road Station Bermondsey and on the Camden Roundhouse. The Royal Society of Chemists reinvented the wheel when they launched their blue hexagon scheme. Lots of Londoners will recognise John Snow’s memorial in Soho, installed near the site of a water pump that led him to discover the epidemiology of cholera, and is one of just three in London. The Dead Comics’ Society (now the British Comic Society) launched its own blue plaque scheme, as did the fictitious Society for the Promotion of Historic Buildings (inventing such non-persons as Carswell Prentice, who almost certainly did not invent the shopping trolley). This year Stoke Newington Literary Festival opted for a hot pink plaque scheme for its weekend of events, celebrating the homes of writers with connections to the area (including former local schoolboy Samuel Pepys). Horror map app Black Plaques went for a funereal colour — although the only horrible thing about their scheme is that they didn’t actually erect any plaques (preferring instead to mark spots on a virtual map). Unfortunately, even London estate agents jumped on the bandwagon. Zoopla picked purple — the colour of wealth, ambition and, er, sexual frustration — for its plaque scheme for the houses celebrities used to live in. Latest additions to the scheme include David Cameron (Finstock Road, W10), David Beckham (Norman Road, Leytonstone) and Alan Sugar (Woolmer House, Upper Clapton) — although the plaque scheme is only a gimmick, and none of the purple plaques actually exist on their respective buildings in London. Despite all the innovation, sometimes it’s the most subtle signs that we miss. 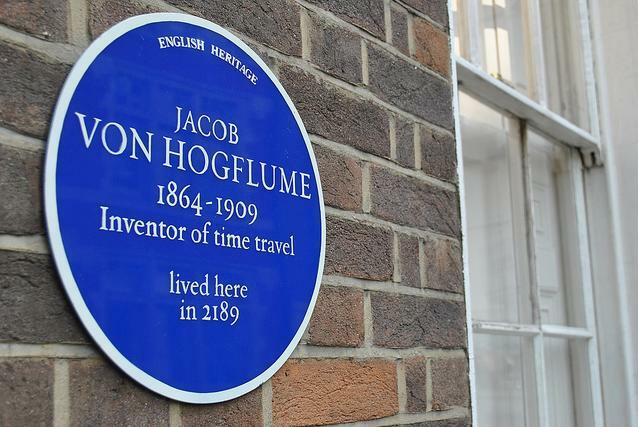 For example, have you ever heard of Jacob von Hogflume, who lived in Highgate in 2182? No, quite. The fake plaque for ‘the inventor of time travel’ was put up in 2012 to commemorate the life of Monty Python comic Graham Chapman after he was dropped from the original plaque scheme due to budget cuts. Very forward-thinking. Blue plaques from the official scheme can only be erected for people who passed away more than 20 years ago (and there are also a few rules about what kind of building can have a plaque). But anyone can nominate a person for a plaque — the form is online here. Likewise, anyone could start their own scheme. Silver, gold, yellow and brown plaques have yet to be launched. Should you want to commemorate Londoners’ contribution to daffodils, for example, or chocolate, then this weekend’s a great time to launch a new scheme.